On the campsite: The base rafting feet in the Aude! The campsite is situated in the heart of whitewater course: 7km downstream 7km upstream between the gorges of Saint Georges and those of Pierre Lys. There are several ways to experience the thrill of going down the river class II to IV according to your desires alone or in groups. 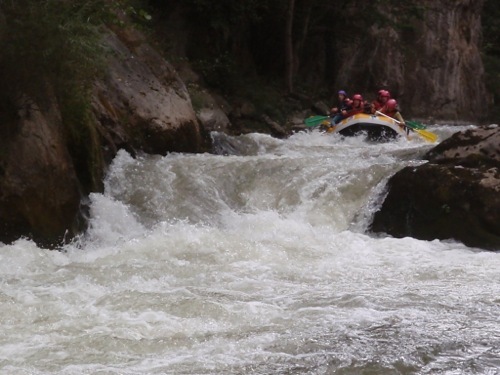 The rafting activity, although tonic, is framed by qualified experienced state accompanying you throughout your descent guides, making it accessible to all routes. Enjoy your stay all inclusive, one interlocutor for you to prepare your stay in closer to your expectations. Raft propelled by paddlers brave! An inflatable boat for 2 people. Inflatable kayak on a car for ultimate thrills and chills on the currents and surf on the waves of the river Aude. You get beautiful canyons in the Fenolheda or the Canigou. Sometimes you progress rappelling down a rope, walking or swimming. You jump in the water holes, you slip on natural waterslides and swim … as you can! Outside this period , please contact us . 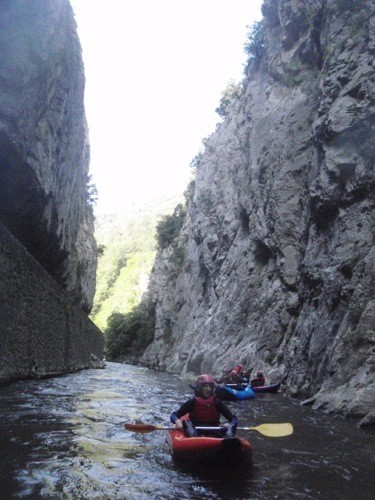 Departure is the highest navigable part of the Aude, 6 km descent to fast against St Georges Gorge (Class III). The finish is less chaotic allowing you to enjoy the extraordinary beauty of the valley Axat . For this course , a shuttle will take you to the departure point , arrival is at your campsite Mill Alíes the bridge. If you choose the integral formula , this course is the first part. Note: Young children , however, can be shipped to the edge of Gorges St Georges to avoid the first tub. Definition: The rafting is a raft zodiac-type (without motor !) Powered by a group of paddlers down the river . The raft is very stable and unsinkable boat despite the shocks of the river. Tapering rates from the second activity ! 2:00 with 1:15 on the water. This course is 7 km classic . The first rapids in Class II ( beginner), III (intermediate) is to learn, different teammates, the paddling and maneuvering their boat to some coordination. These basic elements acquired , you can face the eddies and currents of unbridled Parade Pierre Lys Flipper , Triple Drop , Pass Golem , and Dessert , rapids class III and IV (advanced ) . For this course , the departure is at camping Le Moulin Alíes the bridge. Upon arrival a shuttle will take you back to your campsite. NB : This course is the second part of Ultimate. For safety reasons , children are landed at the entrance parade Pierre Lys . This descent of 13 km includes courses 1 and 2. This course allows you to practice rafting a full range of all obstacles on the navigable river Aude : Gorges de St Georges Basin slalom Axat Parade Pierre Lys . NB : The shuttles to and from the campsite are provided and included in the delivery . Children are landed into the throats of Pierre- Lys . Outside this period, please contact us. 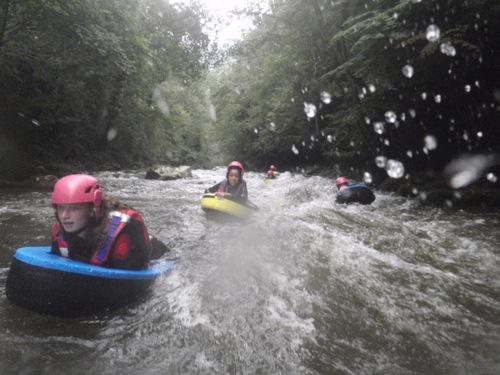 During this introductory course, you leave the Gorges de St Georges on the hubcaps in the rapids of Class III (intermediate level) to arrive on the rapids of Class II (beginner) to Axat Basin slalom France championships. Tapering rates from the second activity! Warning: An introduction and a good physical condition is required. From the campsite Le Moulin du Pont Alies, a shuttle will take you to Bridge baira. 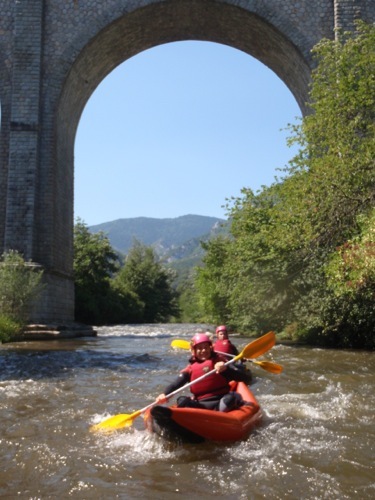 After an introduction to the basics of paddling, you find two for the 6 kilometers of river Aude, the definition of Whitewater! Surf, swirl, slaloms and other games with the flow that put you in the mood immediately. At the end of the stretch of river, calmer, you will have time to enjoy the scenery of the Gorges of Saint George and the bridge in the village of Axat, then you land directly at your campsite. For sensitive people, it is possible to embark downstream grooves St Georges to avoid the first part in Class III and enjoy a quieter section promoting the discovery of the landscape of gorges Aude. 3:00 with 2:00 on the water. Boarding is at the campsite Le Pont d’ Alíes . This descent of 7 kilometers from very sporty river ends after the Gorges de Pierre Lys . This course requires prior initiation and fitness for the last 2 km are very sporty car with a high gradient. It is necessary to have good ease boat . However, if you were not ready , the last two kms can be avoided with a landing at the entrance of the gorge . At the foot of the Hermitage Galamus, religious Building (1395) on the cliff in a natural cavity, you get along 1600 meters of green water at the bottom of the tray l’Agly Corbières, along a canyon several hundred meters deep. Discovery grooves, technical passages are easy level: jumps, ledges and water course. No rappelling canyoning for this course. Possibility of crossing the resurgence turquoise waters Tirounène. This part requires a good swim. At 5:00 with departure mill Bridge Alíes whose 2:00 in water. You progress in a short sunny canyon in the Corbières. 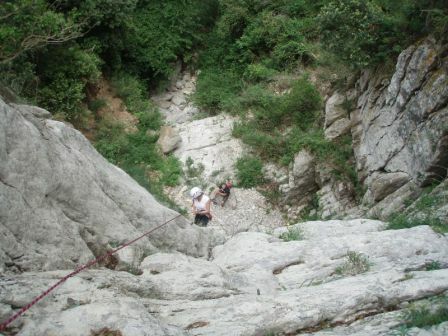 During this very aquatic course, you have the possibility to make multiple jumps and abseiling. Excellent canyon initiation to practice rappelling and jump, you will at the end of the activity, the level needed to “attack” more sporty canyons in the Canigou. Transport to the Clue of Terminet is the responsibility of the participants. Your campsite will assist you in the organization of carpooling. To practice this dry canyon, it must be earned! After a half-hour walk at the foot of the tower of Castel Fizel you arrive at a site of course ideal progression for learning techniques reminder: 5 to 25 meters. This shady ravine offers an exceptional view over the valley of Fenouillèdes. 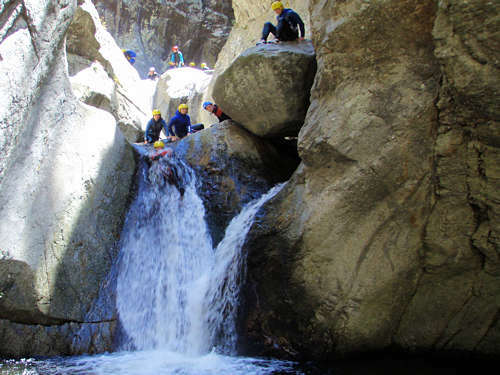 This canyon can be combined with that of Galamus (Water Canyon), as part of a training period to full practice canyoning, as you prepare to become self-rope and practice in more technical canyons. Prior to initiation rope and jumps essential. Maximum 8 people per frame. Of the Massif du Canigou, this genuine natural park built for adventure offers an aquatic growth and progressive but a dizzying 180 vertical meters descent. Transportation is the responsibility of the participants. Planning a picnic. Other sports canyons can be proposed. 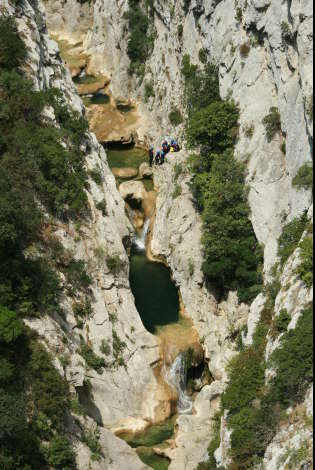 You can combine several canyons in the context of a raid in the gorges of the Aude. 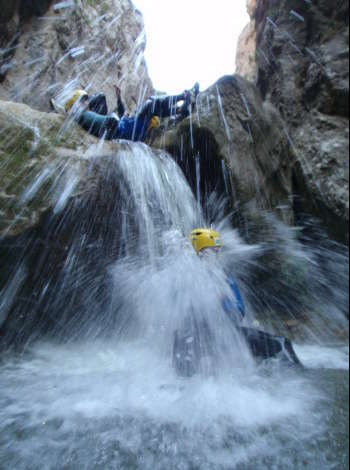 We offer a la carte for groups and seminars combined whitewater course and canyoning in the Aude.